Captain America: Civil War is a movie I’ve been looking forward to for a long time. For those who don’t know: it was actually the movie that inspired me to start this blog. But after years of waiting, what kind of movie is Civil War? Is it a movie about Captain America? Is it a movie about the Avengers? After the Avengers fail a mission that causes collateral damage, the team is pressed to become agents of the world’s governments, going only where a special council tells them to go. This demand splits the team down the middle, with Tony Stark calling for the Avengers to sign this deal, while Captain America opposes it. Captain America: Civil War uses thrilling action, characters we’ve come to love and a political message attuned for today’s culture to create a film that is equal parts fun, emotional and important. It’s distinctly a story about Captain America when it could have easily been focused on the Avengers, and the movie is all the better for it. First of all, let’s address the elephant(s) in the room: there’s a ton of superheroes in here, and with a roster this long, many people took to calling the movie Avengers 2.5 as soon as the full cast list was announced. ‘Civil War’ succeeds by keeping its focus on Cap and Tony. However, something that directors Joe and Anthony Russo have done so well with this film is that everyone feels like they’re in the right place, and as I mentioned before, Captain America is clearly the focus of the story. All the characters are there to serve his story and his conflict with Tony Stark. While a majority of the Avengers take backseat to the main story, they’re never actually sidelined because everyone is given their moment to shine. However, the newcomers to the franchise are the ones who are given the most opportunity to stand out. Chadwick Boseman’s interpretation of T’Challa (AKA Black Panther) is magnificent as it brings an outsider’s perspective to this fight between heroes. And of course, we can’t forget about Spider-Man. He didn’t have a huge role in the movie, but it was definitely a notable one, and if Spidey’s limited screen time is any indicator of things to come, then we’re in for a real treat when his solo film drops next summer. And of course, I’d be remiss if I didn’t mention that like The Winter Soldier, Civil War has some of the best action in any superhero movie ever. Without spoiling anything, I’d just like to say this: When the airport scene starts; buckle up. Chadwick Boseman as Black Panther. One of the things that I love most about this movie is that it is – without a doubt – the most mature Marvel movie that we’ve ever seen. The further we delve into this culture of superhero movies, the more our heroes’ flaws are coming to light. Viewers have started noticing patterns and plot holes in superhero films that don’t solely exist in the superhero genre, but are usually identified as the staples of the genre. Captain America: Civil War is Marvel’s response to that audience. It shoves superheroes into the real world, with today’s political and social climate serving as the backdrop to the story. The film’s subtext – however conspicuous it may be – is actually handled very well. 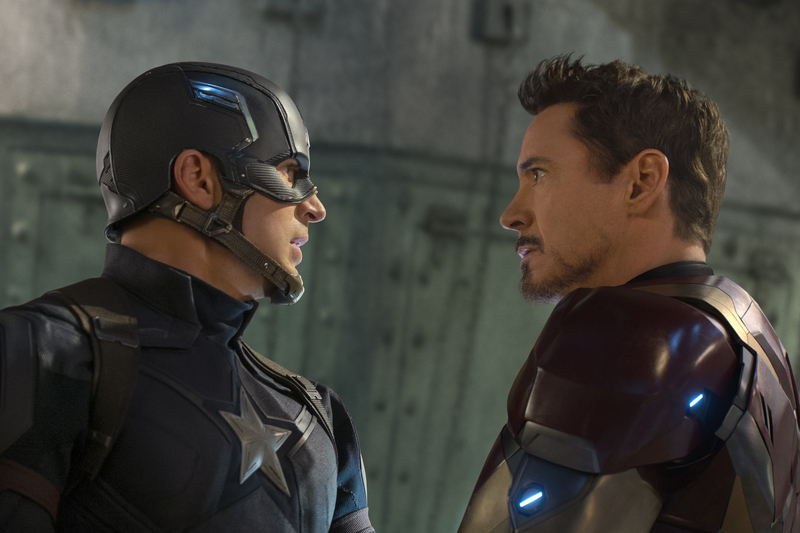 Captain America: Civil War poses a question, but it doesn’t flat-out answer it. Instead of trying to make the movie about sending a message, it puts our favorite heroes in a position to disagree over the question, and as such, we see them take their disagreements to extreme levels. And here’s the best part: like any good debate, none of their fights are black and white. They all play out in shades of grey that expose the flaws of each argument. In addition to this logical side of the disagreement, these points of view are attributed to characters that have been given time to grow, and as such, have made audiences invested in them. This is one of Civil War’s biggest achievements. Not only does it execute its ideological pondering in way that makes sense, it also takes the story of this universe and the characters to a new level that we haven’t seen in a Marvel movie before. The Sokovia Accords would turn the Avengers into government agents. With a story and characters like this, it becomes instantly clear as to why Marvel cast these characters as they did. This movie didn’t call for movie stars; it called for actors and actresses. The strength of these performers is tested with the movie’s emotional story, and every single participant delivers. Robert Downey Jr. shows off his full acting range as Iron Man in a way that we haven’t seen in one of these movies before, and Chris Evans expresses that same range. Other notable standouts are Chadwick Boseman, Elizabeth Olsen and Paul Bettany. The villain in this film (yes, there is an actual villain) is, like most other Marvel movies, incredibly underwhelming. Unlike other notable Marvel villains, however, he is given a human element that brings depth to story in a way characters like Ronan the Accuser, Alrich Killian and the Red Skull never could. Unfortunately, his markedly human characteristics can’t make up for the fact that he’s nothing more than a plot device, and he never feels like an actual to the main characters. This next complaint is a bit double-edged, because I liked the comedic elements, and ultimately, the addition of Spider-Man. They added much-needed relief to the story, but at the same time, it can be argued that they threw of the pacing a bit. This is a movie that is fascinating and exciting without the addition of Spider-Man, and even though his inclusion is an enjoyable one, it throws Civil War off balance a bit, keeping it from being one of the greatest comic book movies of all time. Captain America: Civil War is a huge step for not just Marvel movies, but for the superhero genre as a whole. If superhero fatigue is a thing that’s happening, then it’s movies like these that will counter it. Civil War is a fresh take on superheroes that brings the fantastical out of the sky and brings it down to the real-world level while still remaining fun and exciting. What did you think of Captain America: Civil War? I thought it was terrific, for all the reasons you stated. I actually could have stood for a bit more of the comic relief, because the themes of freedom vs security, vengeance as a justification for violence, betrayal and forgiveness are really heavy and dark. It’s unfortunate that having so many characters makes producing a balanced result a constant challenge, and the action is so fast it strobes and looks weird when projected in 3D, but they succeeded in such a large part I have great respect for what the Russos ended up with. I know they will solve it in future as the tech improves, but the airport fight sequence looked the fakest to me, and indeed it turns out it was almost entirely CGI. I liked the score better than “Winter Soldier”, but I admit I prefer orchestra to percussive synth scores. I also really liked the way they didn’t provide moral absolutes but dealt with the conflict in shades of grey. It’s strange that both DC (in Dawn of Justice) and Marvel (in Civil War) are so clearly exploring the concepts of personal liberty vs social responsibility. I hope they continue to explore these themes in the upcoming films like the Black Panther. Speaking of which, I also really liked how they handled T’Challa. Looking forward to lots more Super-Hero fun in 2017!